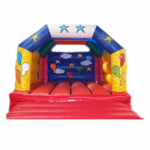 Suitable for children aged 4 – 7 years approx. Supplied with electric motor and extension lead. Ideal for use inside or outside.